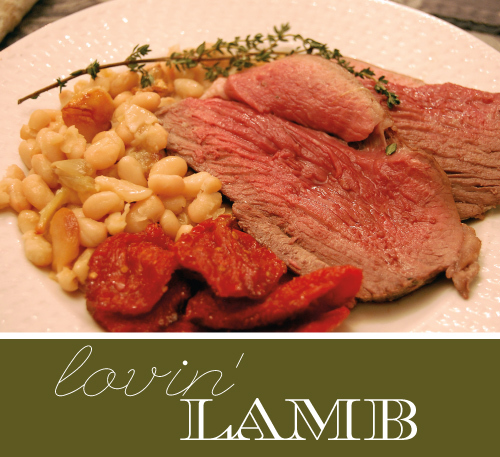 Hi All :) Thanks for coming on over to check out this recipe I put together for the very first D.C. American Lamb Pro-Am Challenge! I have a little experience with this lean, mean grazing machine from a ways back, but love trying new techniques! I was thrilled when I opened my refrigerated bag to find a hunk of a piece (boneless leg) of lamb from Border Springs Farm down in Southwest Virginia. I knew I just had to try baking it in a salt crust - one of the oldest methods for cooking fish that always keeps the flesh perfectly moist and tender! And if that seems odd that fish and lamb can be cooked the same way, give it a whirl, your taste buds will be pleasantly surprised! (And if you'd like, you can go vote for my lamb in the Pro-Am Challenge here!) Recipe and more pics after the jump! In a large frying pan that is safe to go in the oven, heat the olive oil until hot. Add the lamb and let cook on each "side" on medium high heat until browned - about 7-10 minutes. While the lamb is browning, make the salt crust mixture by placing the egg whites in a mixer and beating just until frothy. Add the Kosher salt and Herbs de Provence and mix until combined. When the lamb is finished browning, remove the pan from the heat and pack the salt mixture all around the lamb, leaving no open spaces (you don't want the steam/moisture to to escape when baking). Place the lamb in the oven and roast until the meat registers 120° Fahrenheit for medium-rare. This should take 40-60 minutes, so check early to be sure to not over cook the meat! Remove the roast from the oven and let sit for 10 minutes for the salt crust to set. Then, crack off the crust to reveal the meat. Discard the salt and droppings in the pan. Place the lamb on a serving platter and let set for another 10 minutes before serving. Enjoy! Start by roasting the garlic in the olive oil in a small dish (I put this in with the lamb). Once the garlic is softened and gently toasted (about 20 minutes), remove from the oven and add the salt, beans and sun-dried tomatoes. Place the dish back in the oven so the flavors can roast and meld together while the lamb is still cooking. Remove from the oven once golden brown on top and serve along side the lamb. Enjoy!